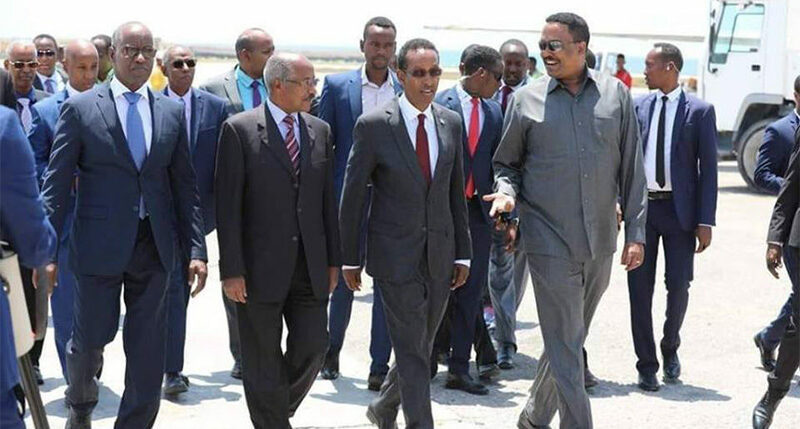 Foreign Ministers of Eritrea and Ethiopia have arrived in the Somali capital Mogadishu for a one-day high-level talk and to reaffirm their solidarity with the Federal Republic of Somalia and the Somali people. 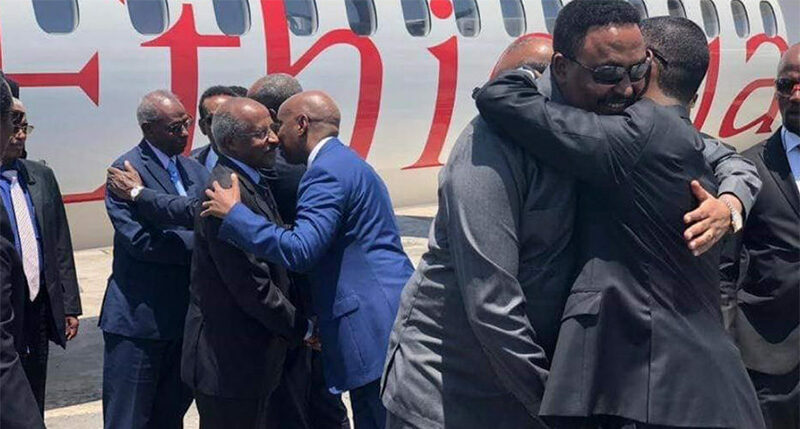 Somalia’s Foreign Affairs Minister Ahmed Isse Awad received his counterparts, Osman Saleh of Eritrea and Dr. Workneh Gebeyehu of Ethiopia, on their arrival at Mogadishu airport. The visit was part of the heightened diplomatic cooperation between the three nations and the continuing dialogue process following the Trilateral Agreement signed by the leaders of Eritrea, Ethiopia, and Somalia in Asmara on September 2018. 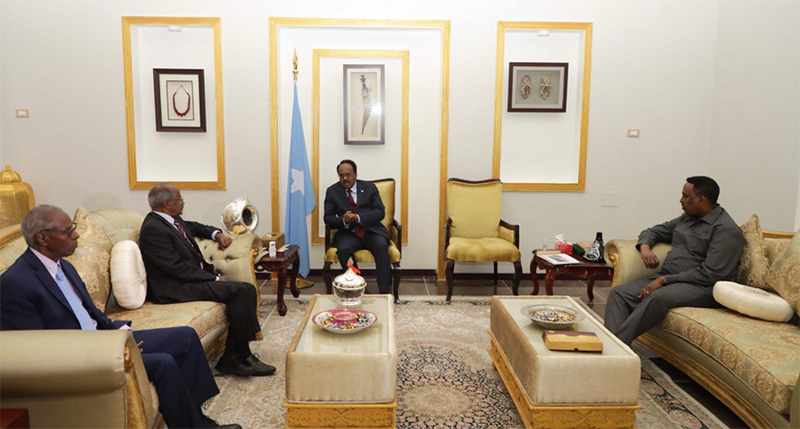 FM Osman and Workneh also met and deliver messages from their respective leaders to President Mohammed Abdulahi Mohammed Farmajo at Villa Somalia. The Ministers also held talks with Somali Prime Minister Hassan Ali Khayre. The leaders discussed progress on the trilateral agreement of joint cooperation in the economic, political and security fields and reaffirmed their continued commitment to contributing jointly to peace, stability, and progress in the Horn of Africa. They also considered the positive developments in the region since the signing of the trilateral agreement, such as the reopening of borders between Ethiopia and Eritrea and the resumption of direct commercial flights to the capitals of the three countries. In a joint press statement issued after the discussion [see below], the foreign ministers of Ethiopia and Eritrea reaffirmed their firm support for the government and people of Somalia. They also called upon the international community to stand united in support of the government of Somalia’s efforts in pursuing much-needed reforms to foster Somali’s long-term recovery. The foreign ministers further appealed to all stakeholders to work towards the peace and stability of Somalia. The Foreign Ministers of the State of Eritrea H.E Osman Saleh Mohammed and the Foreign Minister of the Federal Democratic Republic of Ethiopia H.E Workneh Gebeyehu paid an official visit to Mogadishu, Somalia on 17 October 2018. The visit was part of the heightened diplomatic cooperation between the three nations and the continuing dialogue process following the Trilateral Agreement signed by the leaders of Eritrea, Ethiopia, and Somalia in Asmara, in September 2018. During the visit, the Foreign Ministers were received by the Somali Foreign Minister and paid a courtesy call on H.E Mohamed Abdulahi Mohamed Farmaajo, President of the Federal Republic of Somalia. The Ministers also held talks with Prime Minister H.E. Hassan Ali Khaire. In the course of the engagement, the leaders discussed progress on the trilateral agreement of joint cooperation in the economic, political and security fields and reaffirmed their continued commitment to contributing jointly to peace, stability, and progress in the Horn of Africa. 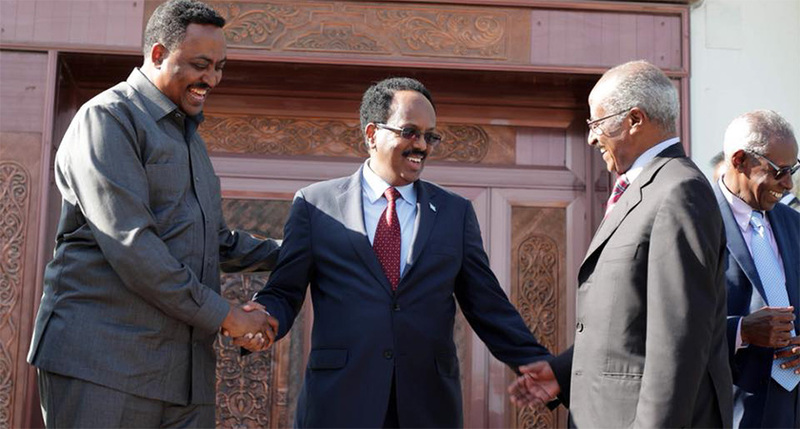 The leaders also consider the positive developments in the region since the signing of the Trilateral Agreement, such as the reopening of borders between Ethiopia and Eritrea and the resumption f direct commercial flights to the capitals of all three nations. 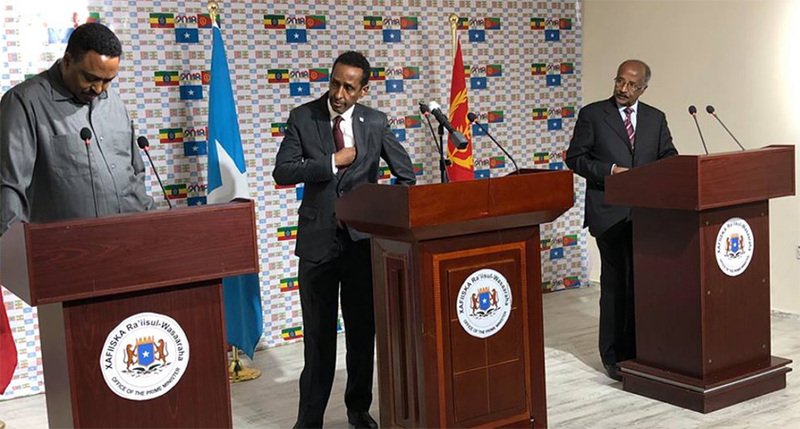 While conveying messages on behalf of their Heads of State and Government, the Foreign Ministers of Eritrea and Ethiopia reaffirmed their support for the Federal Republic of Somalia and the Somali people. The Ministers commended the recent progress made by the Foreign Government of Somalia in their reforms of the economic and security sectors as well as the progress on the various political processes. The Foreign Ministers appreciate the Somalia people and Federal Government’s reform efforts expressing the growing trust in Somalia’s institutions by the international community. The ministers reiterated that Eritrea and Ethiopia will continue to stand firmly by the people of Somalia and its leadership as they present the best hope for the nation’s recovery. They called upon the entire international community to stand united in support of the Federal Government’s efforts in pursuing much-needed reforms to foster Somalia’s long-term recovery. Ministers of Eritrea and Ethiopia appeal to all stakeholder, internal or external, to work towards the peace and stability of Somalia. While reaffirming their mutual respect for the sovereignty, territorial integrity, political independence of all three nations, the leaders restated their commitment to the security, prosperity, and stability of the region.